year old aspiring actress and daughter of Brick. With blonde curls, long legs, and a rosy pout, Brooke is used to the life of money and attention and can’t help but to scoff at the thought of some farmhouse countryside cowgirl being her new sister. The narrative of Spoiled goes like this: alternating chapters between the point of view of Molly, then Brooke, then back to Molly, etc. What I really like about this book is seeing the different viewpoints between the two characters. For example, from Molly’s point of view, Brooke appears to be the haughty, rude and petty mean girl who knows nothing but spite. But from Brooke’s point of view, Molly is a sly intruder who’s out to compete for not just Brick Berlin’s attention, but the attention of the tabloids and media. I like this way of narration because seeing the perspective of both characters is thought-provoking it really makes you think about how every person has their own flaws, insecurities and struggles that you truly CAN’T tell just from outward appearance. I won’t give spoilers, but as much of a typical “unsympathetic mean girl” Brooke seemed, I saw myself siding with Brooke throughout the story, because she was faking a confident persona throughout the book but inside she’s actually a sensitive and thoughtful girl. Spoiled is brimming with fun, games and jokes, but I believe that it dealt with a few profound themes. A major recurring theme was parents. The story starts off just months after the death of Molly’s mother. And the biggest void in Brooke’s life is her own missing mother, who left Brooke without ever looking back. Both girls were hurting. And some of the emotions they expressed (especially Brooke) were surprisingly raw and genuine. 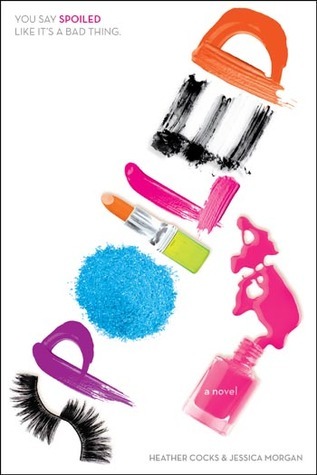 Lastly, I loved reading Spoiled because for the most part, it was fun and colorful and took me to a reality that I could dream about. However, I couldn’t help but to be bothered by how… obvious the plot was structured. I felt the authors planned out a rigid recipe that must be followed and doing this made the characters seem rather fabricated at times. Also, Spoiled is written with cinematography very heavily in mind. I felt like I was watching a dramatic teen movie. This style of writing may be desired, based on personal predilection. I believe, having just read The Catcher in the Rye, I’m just not used to such obviously structured plotlines. Anyways, I recommend this book for any middle schooler who wants to dream of the life of a movie star. And for high schoolers, this book, while a little cliché, is a fun read and I actually couldn’t help but to notice the abundance of SAT vocabulary words in the dialogue!